I don't know why The Custom of the Country isn't a more popular Edith Wharton novel. Oh wait, I do: Undine Spragg. I could see why Undine might turn off readers. She makes Scarlett O'Hara look like Mother Theresa. I love a good b..., um, witchy character and she is that through and through. The story starts with Undine Spragg dragging her socially awkward parents around New York. Undine's father is a very wealthy man after a series of successful financial deals in their hometown of Apex. Undine is determined to climb the social ladder of New York. She uses her beauty to entice a member of one of the Old Families of New York, Ralph Marvell, into marrying her. She's on top. The trouble with Undine is that she is never satisfied. Once she gets what she wants, she no longer wants it. Life with Ralph isn't what she thought it would be. He has his own ideas about family and propriety. On top of that, Ralph is poor by Undine's standards. To keep up with Undine's ridiculous overspending, Ralph works like a dog, yet combined with a generous allowance from her father, it's not enough. Undine manages to convince Ralph that she must go to Paris, alone, and like an idiot, he lets her. While in Europe, Undine lives the high life and sends the bills home. Then she starts getting ideas and sets her sights on European aristocracy. Undine is the type of person that could fall into poo and come out smelling like a rose. She has the most incredible luck. In fact, she is the complete opposite of another Wharton character Lily Bart from The House of Mirth . Just when I thought it was all over for her, something would just fall into her lap! It's almost admirable how she can size up a situation and figure out how it can benefit her. She has a lot of her father in her and if she had been a man, she'd easily be a millionaire. However, Undine is a cold-hearted, selfish, shallow person. She has no feelings for anyone but herself. She doesn't care what pain her actions cause other people, from her parents to her husband to her son. She leaves a trail of bodies in her wake. Though I believe that if someone told Undine this, she'd be genuinely surprised. The Custom of the Country is a story for the 21st century as well as the 20th. Anyone who has seen an episode of My Super Sweet 16 has seen a Undine in the making. She's never been told no and won't take no for an answer. Everything she wants or owns has to be better than what anyone else has. She's a victim of her upbringing. "I want to get a general view of the whole problem of American marriages." Charles has a point but Undine has no interest in Ralph's affairs. She's interested in her own. Undine's treats her marriages like business deals; it's not personal. The men are useful until they outlive their purpose, then they are discarded and she's onto the next one. In a way you can't blame her, it's the only career she can have. The Custom of the Country is a feminist novel of sorts but it's also a satirical look at wealth: the rising nouveau riche of America and the fading old families of New York and Europe. They are all subject to their own follies. I could go on more but I'll stop there. This is now my favorite Edith Wharton novel. It's entertaining and even shocking. 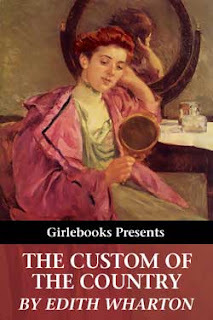 I read this free edition of The Custom of the Country from girlebooks on my new ebook reader. I keep hearing good things about this Wharton novel!!! I'm so glad because I hadn't heard of it before the Circuit, seriously. Sounds fascinating and entertaining. Thanks for the review and for joining the Circuit. I really enjoy Wharton - and I'll be finally reading House of Mirth later this month. This one is now on my radar thanks to your terrific review! I ordered this book recently for no other reason but to add to my Wharton collection. You've written a great review that has me really looking forward to reading it! Rebecca- I hadn't either. I thought it was just going to be another 'girl trampled by society' story but it was so not! Wendy- House of Mirth is one of my favorite Wharton novels. Laura- I hope you enjoy it. Aarti- Yes, she can be but I try to keep in mind that she had issues with her social class used her writing to criticize it. I didn't think it would ever be possible to make Scarlett O'Hara look like an angel. I'm sold! Great review! I really want to check this one out. Your Super Sweet 16 comment made me laugh like crazy. Dang, I wish I would have read this before I went to Borders! I love me some Edith Wharton. I haven't heard of this Wharton before. But it sounds like a lot of fun! Cathy- She was awful- but in an entertaining way. Eva- Yes I have and she reminded me a bit of Becky but Undine is worse. Amy- At least Scarlett had good reasons behind her terrible actions. Undine doesn't. Marie- I hope you give it a try. Stephanie- I hadn't either but it's very good. Undine is the most memorable character from all the Edith Wharton I've read! I can still picture her in my mind, and it's been at least ten years since I've read this one. This was my Classics Circuit book as well, and I did love it. It's probably my favorite Wharton now. And yes, Undine does make Scarlett O'Hara look like an angel. Scarlett at least had some independence, grit, and determination. Same deal with Becky Sharp. Or Carrie from Sister Carrie or Lydia Gwilt from Armadale. Undine outdoes them all. Undine Spragg has got to be the most terrible name in fiction...it's right up there with Uriah Heep and some others Dickens came up with. In fact, that name is so ugly, it hurts my eyes to read it. I think it's why TCOTC has been on my TBR for so long. I do love Wharton and b...witchy main characters, though, so I will have to get it down this year. Maybe I can just make my eye sort of shoooooooooooooooooop over that name!